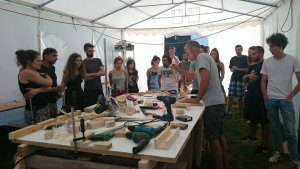 Outward Bound Croatia – our hosting organisation – decided, that they don’t like boring, normal and flawless furniture from Ikea, so they invited us – volunteers, who never worked with wood before – to make some big shelfs and other things for them. We had a great time doing that and I think the outcome was surprisingly very good (well, at least it works). We also made an OBC logo, that now decorates the building. islands and nature parks. We had an amazing time with adventures like hitchhiking and sleeping on the beach. My group and I went to visit Zadar, a beautiful island Dugi Otok and the last day we hiked in mountains near our village, the others visited many cities and tourist attractions like Krka, Split etc. 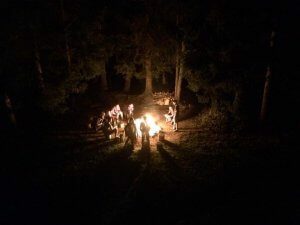 We were separated into small groups and every day we had some duty that we had to do, for example cleaning bathrooms, doing the dishes, preparing meals… Cooking lunch and diner for that many people was challenging, but also very fun and rewarding, I enjoyed that. It was a great experience participating in this project. It made us think about going to some long-term EVS, because it really seemed to be perfect – living in a foreign country, gaining experience, doing what you like and helping local comunity. I am happy that the projects like this exist and that we have opportunities like Erasmus +.